A live studio performance featuring a long set of his favorite songs as part of Stefan Grossman's Guitar Artistry series. 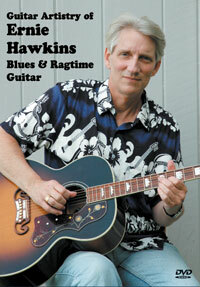 Ernie Hawkins' music represents the very best in finger picking guitar playing. "Rags & Bones" has been hailed as his finest work to date. Western Pennsylvania's master of acoustic blues guitar returns with another spectacular offering of Blues, Gospel and Dance Tunes, with just a little Voodoo thrown in to boot. A real smorgasbord of traditional country blues, by one of the best fingerpickers. Done as a 100th birthday tribute to his mentor, Rev, Gary Davis, you get 3 unrecorded Davis pieces. A lot of CDs promise Celtic, but few deliver such an authentic and enchanting experience. A Celtic Christmas resonates with the sounds of the British Isles. Recordings by contemporaries Willie Walker and Blind Boy Fuller, and modern recordings by many of his disciples and proteges.